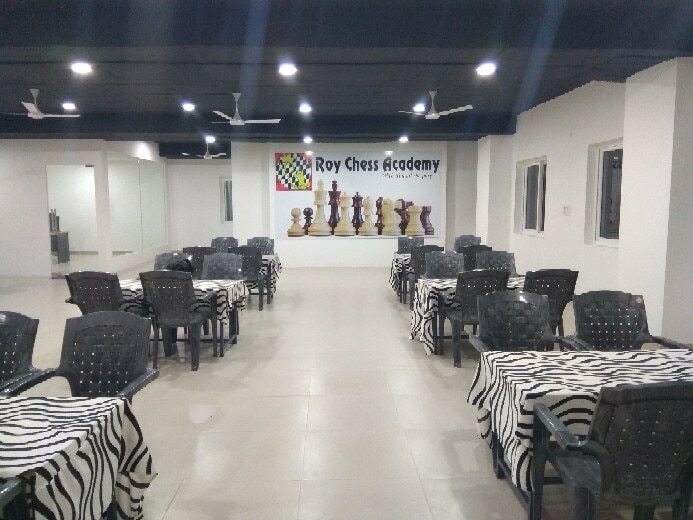 Roy Chess Academy (08071280553) Roy chess academy started in the year 2015 in one of the smart cities "KAKINADA" which is also my hometown with the help of my friend. Now it stood as one of the best rated top academy in Kakinada. With that inpiration we started in the City Hyderabad in 2017. We also provide online classes all over India and also few places from United states, UAE and Australia. Congratulations Dear Roy Kids..!! You did very well in East Godavari District Rapid& Blitz Chess Tournament* held at Rajahmundry on 18th March In Rapid tournament 1. Amrutha varshini got 1'st place in U11 2. Laasya got 1'st place in U9 3. K.Srinivas gopal Reddy got 2'nd place in U13 4. Imran got 1'st place in U11 In Blitz tournament 1. Imran got 3'rd place We wish you all the best for your future Endeavors..! Chess practice with International Rated Players We invite FIDE rated players to play with our Academy kids through this simultaneous games our kids can easily improve their game..!! Roy Chess Academy Hi Santosh, Weekend batch Timings : Saturday 10:00am to 12:30pm Sunday 10:00am to 12:30pm One hour class and one and half hour practice sessions Fee : 6000/- per month Thank you..! !